The property was beautiful and the staff was extremely nice and friendly. Imagine teeing off on golf courses where the waves of the Caribbean Sea practically lap the fairways, dining in restaurants where the scent of seafood wafts through the air while Michelin-starred chefs work away in the kitchen, and beachcombing sands that resemble heaven on Earth. Punta Cana presents all of this and more, set on the easternmost tip of the Dominican Republic in the Caribbean. Gorgeous all-inclusive resorts allow for swimming, sunbathing and spa treatments, while outside of the beaches guests can enjoy an energetic nightlife and excursions to other islands. With more than 200 miles of white sand, the resort of Punta Cana is nearly surrounded by beaches. Lined with coconut and palm trees, the softest shores can be found in the north around Playa Bavaro. El Cortecito Beach is close to the downtown area, which is smaller and considered a fisherman's village. Further south, the beaches become rockier and more rugged. Juanillo is one of the most secluded at the end of Punta Cana an upscale and luxurious setting. Aquatic adventures range from fishing and snorkeling to windsurfing and speed boat trips. Golfing enthusiasts will revel in the dozen nearby golf courses; Punta Cana is the biggest golf destination in the Caribbean. Since rain showers are few and far between, you are sure to complete a round without a care. One of the most popular courses is located in Cap Cana and was designed by golf legend Jack Nicklaus. Souvenirs and beachwear are some of the most popular purchases in Punta Cana. The Plaza Bavaro Shopping Center provides a mixture of modern and traditional gifts. Next to the beach, El Cortesito Flea Market is filled with several shops selling Caribbean clothing and quirky trinkets. For a more traditional shopping trip, the Palma Real will remind you of home, since brand name items are available. Punta Cana restaurants cater to both quick meals and more upscale tastes. Grab an easy slice of pizza, a plate of sushi or wonderful Mexican fare. Families love the wide selection of food for the kids, and fine dining restaurants like Simon Mansion and the Jellyfish abound for those seeking something classy. Many travelers stay at all-inclusive resorts where meals are complimentary inside a range of on-site venues, meaning that guests can save your money for exploring or souvenirs. Punta Cana houses the highest number of all-inclusive resorts in the Caribbean. Large luxury resorts like Barcelo offer swim-up bars, sports courts, kid’s clubs, casinos and massages, while smaller more intimate properties such as Tortuga Bay still have luxurious touches including canopy beds, terraces and access to a lush eco reserve. 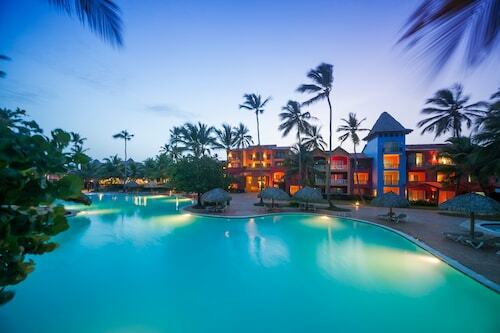 Several family-friendly Punta Cana hotels boast lower prices and fun activities too. Although many travelers will not leave resort grounds during a vacation, it is possible to enjoy events in the town. For instance, the Punta Cana Carnival takes place each March in the Village. A parade filled with top carnival troops and colorful costumes from all over the Caribbean proceeds through the streets, and live concerts showcase musical talent. A more romantic event is the annual tango festival. Dance lovers travel in from all over the world and boogie the entire weekend. The best time to visit Punta Cana is spring. Crowds are few, and the weather is warm with temperatures in the low 80s. It is also possible to find great hotel deals at this time. Winter months are busy, and Punta Cana hotels have expensive rates. Summer and fall experience frequent tropical storms. The property was very clean. They worked very hard to make sure the rooms, pools and beach were clean. The staff is OUTSTANDING! They go out of their way to be friendly and accomodating. The Funjestic Team has many activities to participate in. Entertaining shows at night and diverse dining options. 1 day ago by A verified traveler from Phoenix, AZ U.S.